In Tarot readings the 'Judgement' card is all about new beginnings, the reevaluation of your own life and following the right path for you. You have life changing choices to make, you have reached a crossroads and have the chance to follow your true calling and intuition. Trust your own judgement, follow it and embrace your new beginning. When making your decisions be sure to follow your head and your heart. 'Judgement' can also have messages of being cleansed and refreshed, ready to face the world anew. 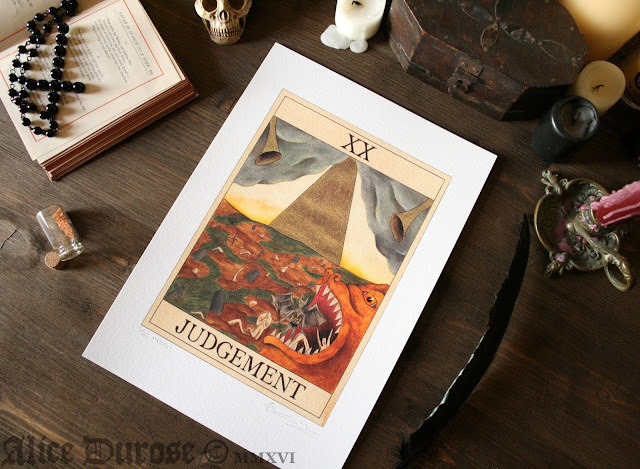 Typically the 'Judgement' card depicts the dead rising from their graves to face final judgement. The Archangel Gabriel summons them with his trumpet and their souls are ready to face judgement, for better or for worse. The scenes are usually rather joyous with only salvation depicted. This simple and largely christian scene is the most common depiction of 'Judgement' across traditional Tarot decks. When designing my version of 'Judgement' I wanted to maintain the theme of reward and punishment which is featured in a number of my cards. I drew on a lot of christian traditions relating to the last judgement and the apocalypse. All of the dead across the globe are rising again to face their final fate and be judged and cast into hell or ascend up to heaven. Those who deserve damnation are being condemned mercilessly by a demon into the Mouth of Hell. The Hellmouth is a recurring element in a number of my Tarot and is used as the physical representation of the gate to Hell. A man prays and begs as he awaits his fate, but it is too late to change the course of his life and atone for his bad karma. The trumpets protruding from the clouds represent 'gods trumpets' from the book of Revelation, which signify the beginning of the end and the last judgement. Seven trumpets are said to sound ushering in the end of the world. With each trumpet comes a different catastrophe or disaster. 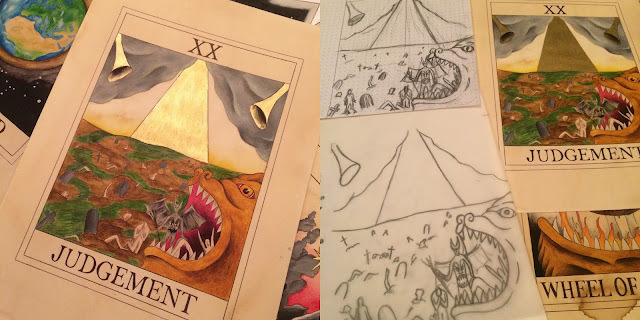 The final 3 trumpets are called the 'three woes', and what my tarot depicts is the third trumpet being sounded, opening up both heaven and hell. The landscape is barren and bleak, as the events of the apocalypse have decimated its beauty. All that remain are the dead waiting to face their final fate. I had a very clear idea of what I wanted the completed 'Judgement' to look like from the very beginning of my sketching. Because the cards are closely related I worked on 'Wheel of Fortune' and 'Judgement' simultaneously, and wanted to have some of the same key features in each card. It was however 'Wheel of Fortune' which proved difficult to resolve, but thankfully 'Judgement' lead the way to a greater design.